Tuesday, Jan. 29, the St. Paul Indians met with the Pleasanton Blu-Jays in a home-TRL matchup. 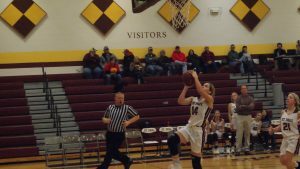 For the Lady Indians, they have been on a hot streak midway through the season holding the top spot in the conference as they have yet to lose a league game (6-0). Tuesday, St. Paul (10-2) clashed with the Blu-Jays (9-4) in a back and forth contest. Both teams exchanged baskets throughout the first quarter as it was a close contest in the making. Junior Katie Coomes provided a solid chunk of scoring for the Lady Indians in the first half with 6 points helping St. Paul maintain the edge. At halftime, the Lady Indians held the advantage over Pleasanton 21-19. The third quarter turned the tide for the Lady Indians as their defense remained composed holding the Blu-Jays to only 5 points. St. Paul’s lead then grew to double-digits heading into the fourth as the Indians offense started to find their groove. Pleasanton attempted to make a comeback effort late in the fourth quarter, but the St. Paul lead became too much for the Blue-Jays as the Lady Indians went on to win 46-38. Junior Katie Coomes made a strong contribution ending her night with 12 points for the Lady Indians. Junior Taylor Wiatrak matched Coomes scoring finishing the game with 12 points and 6 of those points coming in the fourth quarter alone. The Lady Indians (11-2) continue their strong play as of late maintaining their undefeated league streak of 7-0 as they look to capture the league title. For the boys, they come off a tough 71-64 loss to the Northeast Vikings which moved the Indians (6-6) to second place in the TRL. In their most recent contest, Jan. 29, St. Paul met with a solid Blu-Jays team (9-4) in a league battle. It was a low scoring affair for both teams in this game as baskets came at a premium. St. Paul would be held to only two points in the first quarter, but Pleasanton’s lead stayed within reach scoring 7 points. The offense for both teams pick up more in the second quarter but the Blu-Jays maintained their narrow lead staying ahead of St. Paul 19-13 at halftime. Much like the first quarter, St. Paul was held to only two points in the third as the Blu-Jay lead grew to double-digits. From there, Pleasanton’s lead and the Indians struggle offensively resulted in the Blu-Jays defeating St. Paul 41-27. Junior Adam Albertini lead the team in scoring on the night with 10 points for the Indians. Senior Kenny Haney made a contribution to the effort ending his night with 5 points for St. Paul. With this loss, the Indians (6-7) drop below .500 and move to third place in the TRL heading into their next matchup. The St. Paul Indians will have a short-lived break as they will stay home for their next game Thursday, Jan. 31 against the Frontenac Raiders.